If you follow me on Snapchat (fashionhayley) then you would know I tried on my dream dress on Friday and just had to buy it immediately, then wear it two days in a row because I love it that much. The dress in question is the one I'm wearing in this post, a white broderie anglaise lace dress with bell sleeves and a two tiered short skirt from Seed Heritage - to be perfectly honest it is actually my dream wedding dress, exactly what I imagine wearing if I were to ever get married again, like EXACTLY what I always dream of for that occasion. Anyway, as I am not getting married any time soon I thought, you know what, I can damn well wear this dress anyway and in a way marry myself by treating myself to a dress that makes me feel this happy. Everyone on my Snapchat told me to buy it while I was trying it on and even though I didn't need their reassurance it did definitely cement my decision. 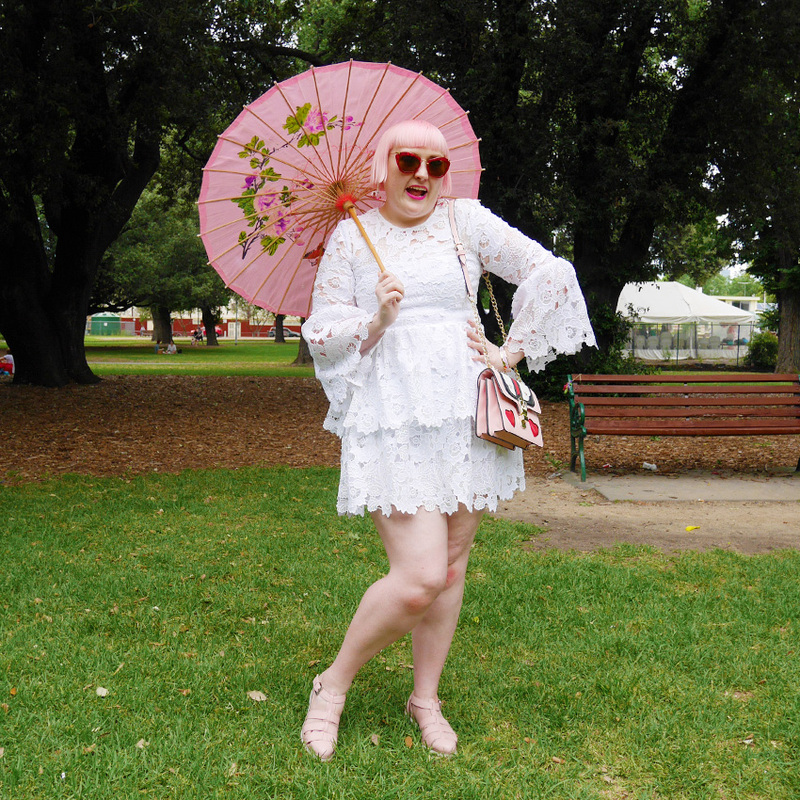 I wore it to the new collection launch of Twoobs as seen on my instagram on Saturday, then on Sunday I wore it to my Snapchat meet up picnic which is when I took these photos with the amazing help of Natalie who has an awesome comic book she just released. 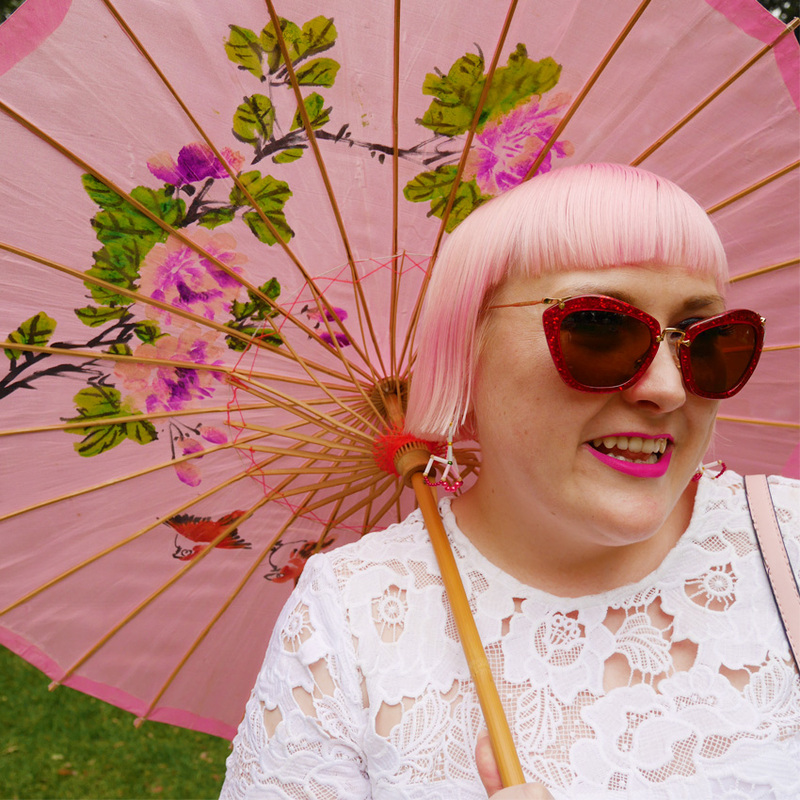 The picnic was really a lot of fun, it was so lovely to meet people who watch my snaps every day. 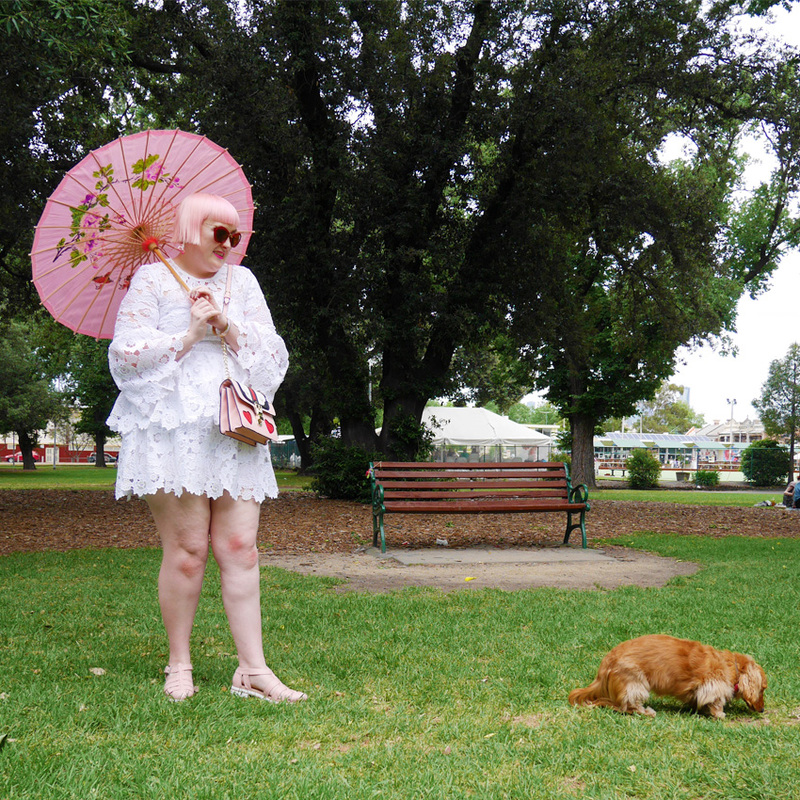 While Natalie and I were taking my blog photos this cute little sausage dog named Audrey waned to join in on the fun. A little too fast for my pat haha. What a cutie! 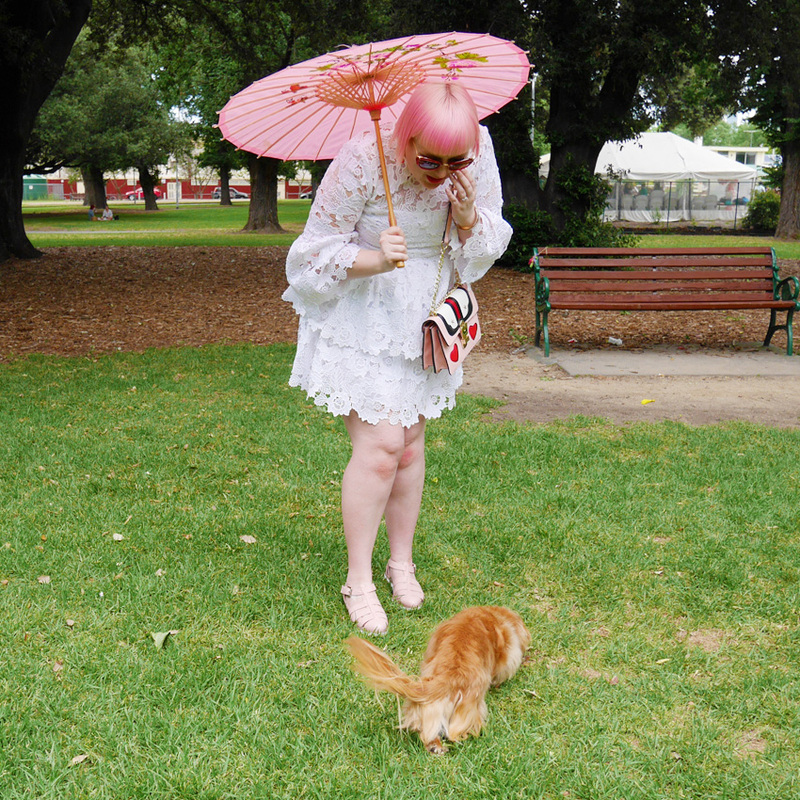 My heart still breaks with missing my dog Hachiko as my ex won't let me see him, but chance encounters with cute dogs at the park do perk me up. 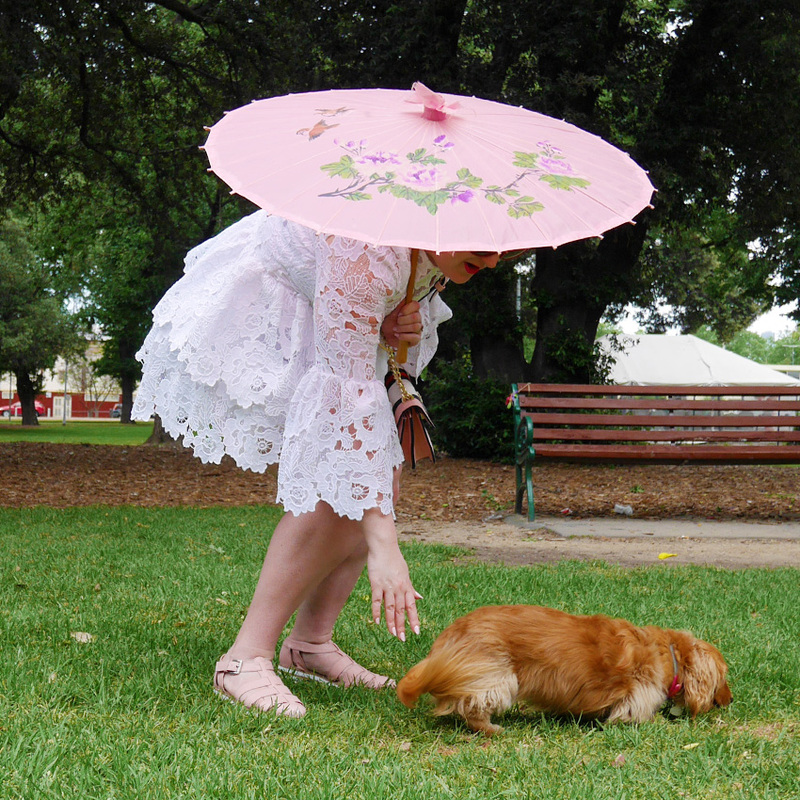 I have had my pink parasol for so many years but it never gets old, it always looks so fun and chic. Look how beautiful the lace is up close, I just adore this dress so much! These shoes are my new favourites, so comfortable and practical yet still quirky and cute. So amazing, brand-new spring. It's nice long maxi dresses. I've had fun reading through your archives. I share with you a love of all things rainbow and sparkly, so I've enjoyed seeing you post about those things.